I need to get some disclaimers out of the way first because I do not believe there is such a thing as an objective device review. I own a bunch of Windows 7 PCs and slates, iPhone, iPod, MacBook Air running Windows 7, etc. I don’t really hate iOS as much as I find it to be useless and Microsoft Office for the Mac feels like driving a replica Lamborghini built on a Fiero. I already own an iPad but my kids use it more than I do. I only use it on the road and mostly for email and some light browsing when I don’t want to power on my laptop and mifi. Movies, games, chatting, etc. I’ve just never been a big fan of it, I find the tablets in general a very painful intermediary between phones and laptops. When Microsoft announced Windows RT powered Surface that cost less than the iPad I jumped on it because pricing this device reasonably means it might actually have a feature instead of being added to the collection of failed Microsoft projects. 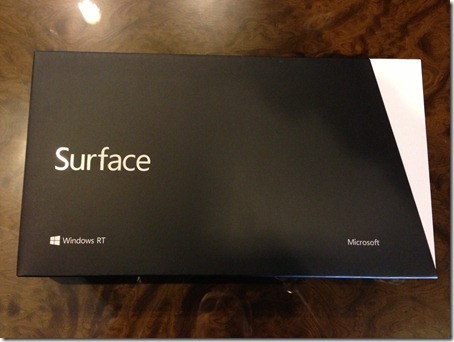 I did not buy the Surface because I wanted a laptop replacement – in my opinion, such a thing does not and never will exist – it’s a 10” screen. 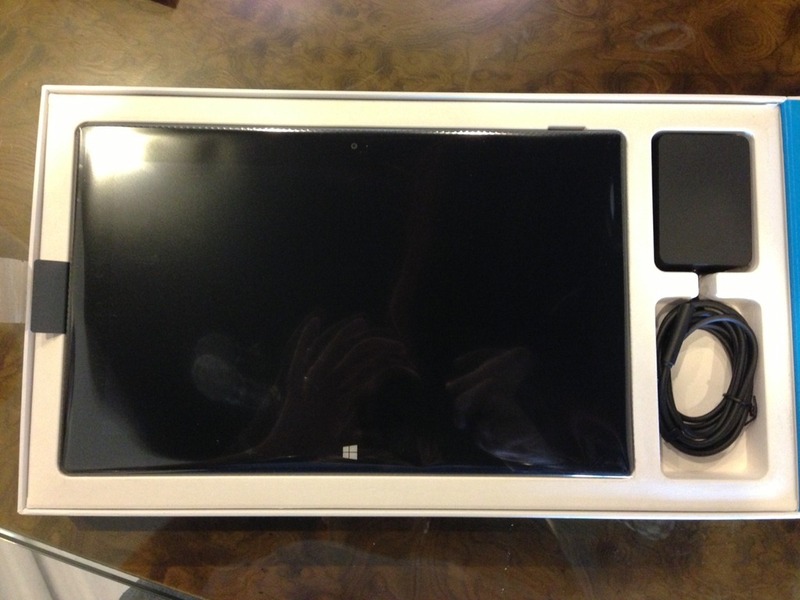 I bought it because I wanted Microsoft’s version of a tablet that ran Office. No, this does not run Outlook. It does not run Windows x86/x64 applications. But is this just a large Zune or is it a mini-PC? Read on. It doesn’t look or feel like a cheapo Android knockoff tablet. It does not come in a package that you’d expect out of Dell, full of packing material they wouldn’t even ship eggs in. No stickers, no crapware, no unwrapping the device out of padding, wrapping foil, bags or other nonsense. It’s just a huge piece of glass. Well packed. The display is incredible. 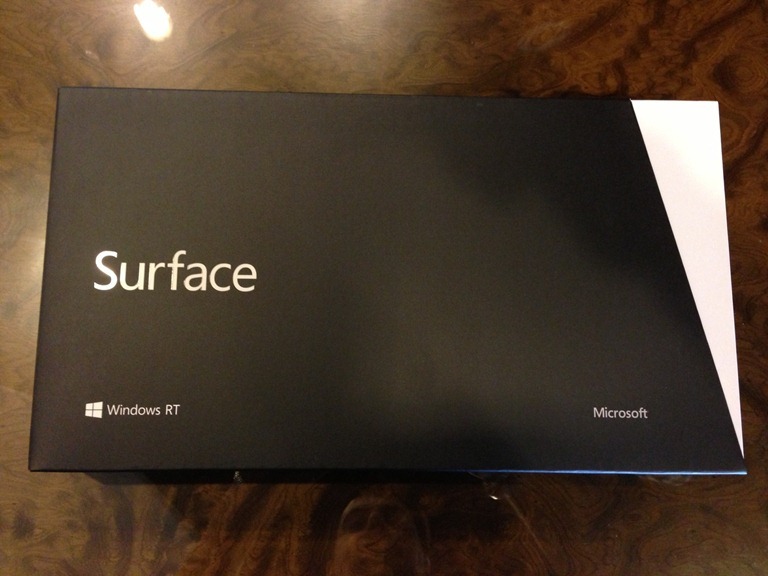 It’s no Retina but I could not see the difference between the Surface and the iPad right next to it. Netflix played just as well as it did on the iPad and on my PC as well as the laptop. This is very clearly a 1.0 product. There are lots and lots of bugs. It took it 10 minutes to get my PC ready. For what, I don’t know. Keyboad: The soft touch keyboard cover is terrible. That’s the best way I can put it. It gets dirty easily. It doesn’t register the keys as well as a visual keyboard or any other tablet keyboard I’ve ever had. To add insult to injury, when Surface goes to sleep and I open it up again… the keyboard no longer works and requires a reboot. OS: The OS doesn’t run x86/x64 Windows apps – not a show stopper since this is more of an email/web/entertainment device with a Windows look and feel and Office – but if you’re expecting to fire up Quickbooks on this and do books on the road, it’s not gonna happen. Size: This is not a one-hander. Not even close. The device is very heavy compared to other 10” tablets and it’s not something you’ll likely ever use without setting it down. While the device was clearly designed to be sat down with it’s kickstand, I do use my iPad for reading and I often hold it in my hand – not gonna happen with this one. One more thing: The power brick / cable for this thing are friggin huge! So much for just throwing it into the case. Perhaps the most disappointing piece.. no Flash. It would be nice if it came with some Azure service credit to transcode my collection. I know, inappropriate.. but if you’re going to come out with the Internet consumption device it better be able to consume the thing Al Gore designed the Internet for. Kickstand: Very elementary but very nice. I often end up standing my iPad up either on the mattress or a stack of magazines or against the seat in front of me – it’s always propped up against something and to be honest not quite natural at all. The kickstand puts it into a natural position. Office: Nuff said. I’ve seen other office products and well… yeah. This has Office RT which is damn close to the real thing. 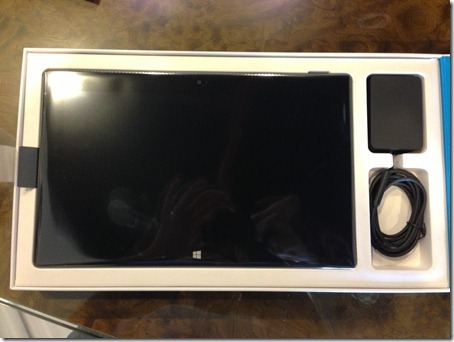 Look & Feel: This looks, feels and acts like a Windows PC. I don’t feel like I’m crippled to a phone experience on a large screen, it feels like something you can write long emails, create documents and forward them along with pictures, video, etc all in the same shot. It’s 1.0. Definitely not worth your money right now. If you expect to use the keyboard, buy the more expensive/bulkier one because the soft cover one is terrible. It’s replacing my iPad that’s for sure. 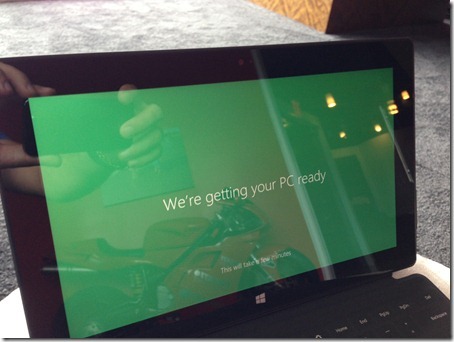 As for the lack of Outlook / x64/x86 apps and so on – if you need that, wait for Surface Pro. Personally, I am never going to get anything massively productive done on a 10” screen so this one is good enough. Seems like Microsoft is back? I got one as well on opening day. I agree with most of your comments and think it is a pretty great machine for what it is. My keyboard is fine after it wakes up, not sure why yours would need a full reboot. I did have it not come back once and I just removed the keyboard and snapped it back on and it came back. 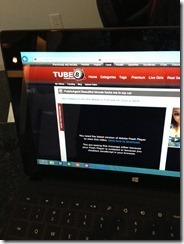 The screen is really great and the widescreen especially is very good for the Windows 8 metro interface. Snapping applications and all that stuff that seems awkward with a keyboard and mouse suddenly makes a ton of sense and is super slick. I didn’t thnk the power brick was that big, maybe a inch in one direction bigger then the iPad brick. The touch keyboard is pretty sucky. You have to press where the sensors are and it’s a very light feel if you’ve pressed it successfully or not. The mouse clicker is even harder as you can’t see the border of the button (especially if in a darker room) and I find myself tapping all around the bottom of the pad trying to click. It needs white outlines or something around each key to help aim. Maybe one of the touch covers in a non-black color would be easier to deal with. Apps, no biggie, they will come–check the store daily for more. Has Citrix receiver already! It’s fantastic cloud mobile connection device, IMHO. Office 2013 just had a 500MB update I installed last night, still have to see what’s changed there. All in all, it’s very much business-usable and I do think Microsoft is on their way back. It will take the market some time to figure out how the Surface/RT tables fit in as they don’t really fit squarely in any category right now. Vlad.. You didn’t mention if you were able to load up Outlook via the browser web app? Finally a Surface review I can believe! Given that you have to patch it for the included flash in IE10, I’d double check that “no flash” statement. I picked one up for Monique and one for myself. It’s become my main carry-about when working on the road. While not a full laptop replacement, and I totally agree with you that there is no such thing, for my laptop it does do a great job for e-mail, spot server management, and the occasional Word document. Monique’s pretty happy with it so far since the transition from her Lumia 710 to the Surface meant very little learning curve. And yes, there are v1 things happening. In the end though, it paid for itself on my first client visit where I needed to test and re-work an errant wireless network setup. It does have good built-in wireless. Bought one after seeing it run the full version of Office. Amazing. But didn’t use it much past the 3rd day after I realized the e-mail/calendar client and web browser were worthless. Slow and clunky. Back to my iPad 2. +1 Perhaps the most disappointing piece.. no Flash. Even after the security patch flash still does not run!! Mine is going back tomorrow!! I find the review rather interesting, especially the whole Flash comment, considering the iPad doesn’t have flash either, and Adobe has stopped making flash for the Android OS. I also would like to hear from Vlad on it since the first round of patches, and the Firmware update, which I noticed solved issues for me with the keyboard and responsiveness of the Surface (yes I did a review and a compare/contrast on my blog). As far as the soft keyboard goes, I personally love it, and weight wise, there isn’t much difference to me between it and my iPad2. Still, a well thought out review, that I think could be updated. Without owning or using the product, I expected it to be just as you describe. The lack of Flash would be a show stopper. My son took my iPad2 as his high school text books are now electronic (saves me money). The iPad drawback is still the lack of Flash support. I always expected to wait for the Pro version as I wanted an x86 type processor. What will happen to Intel with all of these ARM processors. It’s funny to see you own the Apple hardware and still bash it to some extent. The Fiero comment is hilarious and I could not agree more. I caved and bought the 15″ retina MBP to replace my 13″ Air that my daughter took from me when her MBP died. Damn those expensive kids and their entitlement! Since I must have Windows for work purposes, I run OSX with Fusion 5 and Windows Enterprise Server 2008 R2 configured as a desktop. Good thing I have 16Gig RAM to run all the VM’s. I have to compile and test my Windows code (still doing that crap after all these years). Glad to see you still have all your wit; forgot how funny and cynical you can be.